Alastair Cook has warned that India will be â€œitchingâ€ for revenge over England next month when the two teams resume their rivalry in a whirlwind one-day series. England will play five 50-over matches in five different cities in 11 days on a short but intensive tour that represents Cookâ€™s biggest challenge as an international captain. Their cause has been helped by injuries ruling Sachin Tendulkar, Virender Sehwag and Yuvraj Singh for the first two matches from the Indian squad which was announced on Thursday. Harbhajan Singh has surprisingly been dropped despite recovering from a side injury. Regardless of the injuries, Cook is aware on their home territory India are far more able to plug gaps in the team than on the green, seaming pitches of a damp English summer. England have not beaten India in a one-day series in India since 1985 and their last two series ended in 5-1 and 5-0 thrashings. The usual failing of struggling on slow, turning pitches against spin bowling resurfaced during the World Cup in Asia last spring. It will be the ability to hit over the top, and straight, that will be crucial, particularly the Powerplay overs. That is when Cook and his partner Craig Kieswetter will look to set the tone when the first match starts in Hyderabad on Oct 14. Kieswetterâ€™s favourite scoring area is straight but Cookâ€™s cutting and pulling will be nullified by the lack of pace in the pitch. However, he has a proven ability to work out a method of scoring runs even when conditions are not in his favour. 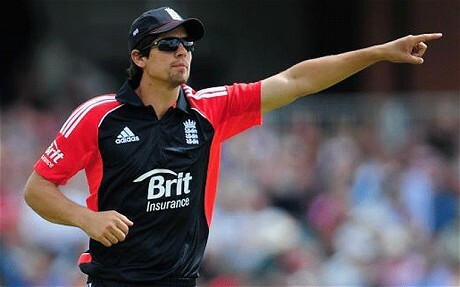 He also flies to India on Monday riding on the confidence of a good summer in one-day cricket when he averaged 58, but more importantly, scored his runs at a strike rate of 95.
â€œIt could not have gone too much better for me,â€ said Cook, who was speaking on behalf of England team sponsor Brit Insurance. â€œAs a batsman I always said I could play one-day cricket for England. I had to back that up with action straightaway and as a captain you want to start well as a player. It gives you that added sense of authority. It kind of ends doubts and helps your captaincy.